If I could make a bargain with the universe over what I was allowed to eat without causing an eczema flare-up, I wouldn’t ask for much. It turns out, if I don’t eat butter I eat a lot less bread, and if I eat a lot less bread I eat a lot less cheese. I miss it, but most of it isn’t a deal breaker. The vast quantities of mature cheddar I used to get through were just gluttony. It also turns out that the only thing I really miss about milk is the tiny amount I put in a morning cup of tea. I like to drink. Just one. Cup. Of. Tea. Per day. I’m not your typical British person (or teacher) in that respect. I don’t even like it in the afternoon, unless there’s a Fortnum and Mason Dundee cake in the vicinity. So I will set wheat bread* aside. And I will forego butter. And I will put oat or almond milk on my cereal and peanut butter on my glutard toast. A tiny drizzle of milk in a single mug of tea, once per day. That’s it. I’ll stir oat cream into my soups and try not to think about cheese on toast, and I’ll drive to Woburn Sands for glutard fish and chips, if I could just have a carbonara occasionally, and a Saturday pizza made with my own hands, and a mug of Yorkshire tea. Surveying the trolley after doing the grocery shopping last night, I realised that – for someone who is supposed not to be eating wheat anymore – I still have way too much invested in beautiful bread. It’s the stuff of life! The big Waitrose in MK does a sliced (and toaster-shaped) sourdough from the Bertinet Bakery that is possibly the best bread I’ve ever tasted. It puts the “sour” in sourdough. At £3.50 a large loaf, it’s not so preposterously expensive that you pass it over. After all, a standard gluey white sliced loaf is over a quid these days. In addition to that beauty, I was unable to resist the opening offer on Waitrose’s sourdough crumpets, and there was a nice filone pugliese that crusted up beautifully in the oven as an accompaniment to tomato soup. Meanwhile, because I’ve been playing fast and loose with the gluten consumption lately* (I’m not coeliac, but have developed otherwise unexplainable eczema in my middle age), I’ve got itchy patches springing up at the top of my left leg and the bottom of my right. Medical tests were so inconclusive that I can’t even say for sure that my eczema is caused by gluten, except that it clears up on its own if I don’t eat it. And, yes, that could all be the placebo effect, but that’s the problem with the human mind. This whole business kicked off with insomnia, which the doctor – not wanting to give me sleeping pills long-term – tried to treat with antidepressants (Sertraline), and which then triggered the eczema. My latest symptom is that my eyes won’t stop watering. Especially first thing in the morning, they’re streaming all the time. It kind of clears up once I’m at work, but I don’t know if that’s because I’m away from the environment that triggers the tears, or simply because I’m at work and otherwise distracted. Because the thing is, the itching from the eczema also tended not to bother me (much) during the busy working day. So: either I’m a mess of symptoms which are all stress-related; or I’ve developed allergies – in my 50s – to a variety of substances. Is it gluten? Is it the pillow? The mattress? The cat? Dust? Meanwhile, I’m still sleeping really badly. I get that sleeping pills are addictive and that no responsible doctor would keep prescribing them, but if I’d stuck with them, maybe none of this would have happened. *We had visitors last week, so I was cooking for nine, which meant that doing a special glutard meal would have been a pain in the arse. A biga or poolish is a form of bread starter or pre-ferment. Not exactly a true sourdough, it’s a way of developing complexity of flavour and a light, open texture, and still requires some planning ahead. Since my problems with eczema* started, I’ve been experimenting with longer fermentation times for my pizza crusts. You should do this anyway, of course, but a busy life and a packed TV schedule make it too easy to opt for the lazy option of making a quick dough with 10g of instant yeast. Anyway, Saturday night pizza is sacrosanct, and it currently the only wheat-based thing I eat in a normal week. Caputo Criscito is a means of making a long-rise dough without the need for a biga. It’s essentially dormant “ancient mother yeast”, which is reactivated in a dough by the addition of a small amount of live or instant yeast. So for a 48-hour dough, I added 1/4 teaspoon of instant yeast; for a 24-hour dough I used 1/2 a teaspoon, though I could probably have gotten away with less. Caputo sell their Criscito in a 1kg bag (it’s mixed with 00 flour), and recommend 30g per kilo of flour in a recipe. So for my 450g Saturday night pizza dough, I added a tablespoon, which worked out at 15g. My first attempt was made with the last bit of Caputo Blue flour in the cupboard. I made the dough and left it in the fridge from Thursday night to around noon on Saturday. Then I left it out at room temperature for the early part of Saturday afternoon, before making up 3 dough balls, which I left for a couple of hours. Room temperature in our house is currently around 18°C, because we haven’t got the heating on yet and haven’t lit a fire. The resulting dough was beautifully stretchy and cooked to an open, airy texture. I stretched it into rounds that were almost transparent in places. My wife loves thin crusts, but the cooked crust still had a structure of air bubbles, crunched when you bit into it and yet remained chewy. It was probably the best pizza dough I’d ever made. Instead of my usual Caputo Blue, my latest 25kg bag of pizza flour is Caputo Viola (more like Lilac), a flour designed for long-rise doughs such as the tradition Roman Pizza a Metro (pizza by the metre). I obviously don’t have the means to make pizza a metro. Although I do have a rectangular barbecue stone in France that would allow for a slightly longer pizza, a longer peel or “pizza shovel” would cost about £60. The recipe for dough made with Caputo Viola uses the whole 25kg bag (! ), but I think it requires about 62% water to flour, as opposed to the 65% of Caputo Blue. In the event, I added a bit more water to make a quite wet dough. I forgot to make it Thursday night (doh), so I made it Friday night with a little extra yeast, as I said above. Early Saturday afternoon, I divided it up into three balls, which by early evening were very well risen. Again, this dough stretched out easily, and cooked (on the barbecue stone) to absolute perfection. The crust was crispy and chewy and put every single restaurant pizza I’ve eaten to shame. But it was also, far and away, the best crust I’ve ever made. The only problem, for us in the UK, is getting hold of this stuff without breaking the bank. I bought mine from a vendor on Amazon, and just to buy Criscito on its own will set you back £12.09 for a 1kg bag… plus £16 delivery. I bought the Caputo Viola and Criscito in a package for £41.66, plus £26.10 delivery to the UK. This seems outrageously expensive, but if I set myself up as a Caputo distributor and used, say, Parcelforce 48 as a dispatch service, it would cost around £40 to send a 25kg parcel. So £26 is not so bad, after all. Worth it? Well, if you’re as obsessed as me, you simply cannot buy better flour in the UK. *The eczema is currently under control, with just a hint, now and then, of itchiness on my left thigh [touches wood]. The true test of any gluten free pizza is whether it is as palatable cold as it is hot. What might pass as acceptable straight out of the oven can be very different the following day. Slimy is the adjective I’d use to describe the sensation of swallowing GF pizza — until now, that is. Before I get to the Caputo experience, here’s what I’ve tried so far in my search for an acceptable GF pizza. I ordered some pizzas from this chain, who offer a gf option with any topping. These crusts are clearly industrially produced pre-formed bases, supplied to restaurants to use on request. They’re not particularly brilliant. Quality is acceptable hot, not so great cold. An expensive option, in excess of £10 per (not very big) pizza. I haven’t tried Dominos, who only offer a limited selection with a GF base, but I suspect similar outcomes. Bob’ Red Mill The first home-made GF pizza crust mix I used was Bob’s Red Mill (Amazon), which is a blend of brown rice flour, potato starch, millet, sorghum, tapioca, and potato flours with both xanthan and guar gum. These kinds of blends are hard to reproduce at home, as they require you to have a cupboard full of different flours. This mix makes a very wet dough (the recipe on the packet calls for eggs as well as water and oil), which is hard to work with: you basically have to push it into a baking tin with your fingers. I was very disappointed in the result, both hot and cold. It took a lot of cooking (much more than a standard bread base) and the texture was very gummy. I moved on to try teff flour as a main ingredient (again, from Amazon), and this was fairly successful, making for a crisper pizza crust with a decent flavour. It was like pizza made with wholemeal flour, which might actually appeal to some people. It was definitely edible and not unpleasant cold, though not brilliant. In most supermarkets, you can find Schär pre-cooked bases (on the small side), which are okay, but nothing special, and no good cold. They come in a vacuum sealed bag, which means they keep indefinitely, I guess, but they’re only average (as, to be fair, are most pre-cooked crusts). The better pre-made option was a raw dough (chiller section) in the French supermarket Auchan. This was pretty good, though again on the small side, and required five minutes pre-cooking before you put the topping on. It’s a characteristic of GF (so-called) dough that it requires more time to cook than wheat-based options. By a weird coincidence (or is it? ), the people from whom I buy my 25kg sacks of Caputo (blue) pizza flour emailed me the other day with news of a new product, Caputo Fiore Glut. Well, I couldn’t get to the laptop to order quickly enough. My main reason for optimism is that Caputo is an Italian product aimed at professionals. The recipe on the (1kg) pack is for the entire pack, for example, and the instructions on the web site suggest making the dough balls in advance and keeping them in the “walk in cooler”. I didn’t think Caputo would put their name on anything less than the best product you can get. Caputo are the Apple of pizza flour. Or something. The first surprising thing about this flour mix is that the recipe calls for 800 ml of water per kilo of flour. Regular blue Caputo uses a ratio of 65% water to flour for a pizza base (depending on humidity, you might add a bit more or less). 80% water suggested this would be a very wet dough, but it was not. In fact, I added a little extra water and it could have taken more. I didn’t use the whole kilogram, but enough (300g) for a couple of 30cm pizzas. The mix* consists of Rice starch, rice flour, potato starch, soy flour, sugar, both guar and xanthan gum (your gluten substitutes) and fibre. There are no eggs required in the recipe, just water, yeast, salt, and a bit of oil. The second surprise was that the dough rose quite quickly. I didn’t have time for a long rise, so I added a couple of tsp yeast, and it rose at the same rate as the regular wheat dough I made at the same time. In contrast, the dough made with Teff flour certainly fermented when left, but didn’t noticeably rise, even when left for several hours. The Caputo GF dough was slightly harder to work with than Caputo Blue, obviously not as stretchy, and harder to move onto the peel. The greatest challenge with GF pizza dough is to keep the shape regular, but I don’t worry too much about that — as you can see. I rolled the second one directly onto a peel, which made it much easier to handle. I cooked the two pizzas on my stone on the barbecue, sliding from the peel using cornmeal to prevent sticking. They cooked more or less as quickly as a regular base. The results were crisp, with a good inner texture of air pockets, and while not as tasty as a base made with Blue, they were pretty damn close. I send love and kisses to the whole Caputo family with gratitude. And, just for the hell of it, I tried a slice cold that had been in the fridge overnight, and it was absolutely fine. No gagging on the claggy, slimy, gummy texture. *As a bonus feature, according to the specs, this flour features hardly any insect cuticle or rodent hair. I’ve been (trying to be) gluten free (GF) for four weeks now, and I’ve spent three weekends in a row experimenting with various ingredients to make baked goods and other things. I’ve also raided the supermarket shelves for GF items with mixed success. Although some of the seeded breads are okay in small quantities, and as long as you toast them, I’ve been struggling to find something that hits the spot when it comes to spreading butter on it. I’ve thrown away one failed so-called bread and found that most of the shop-bought stuff has to be heavily adulterated to make it palatable. I tried a Warburton’s sliced brown loaf, for example, which I could only eat in the form of an egg/bacon sandwich or crisped up in olive oil as croutons, or smothered in (GF) welsh rarebit. I used the Doves teff flour last weekend to make the same cookies, but their recipe had water in it, which was bizarre. As with so many of these things, a lot of recipes and pre-packaged goods try to take into account multiple dietary needs. In this case, I guess they were avoiding egg as well as gluten. Well, this weekend, I made the recipe with an egg instead of 4 tbsp of water, and it was much better. The cookies held their shape well and were less crumbly. Teff flour (even this “wholegrain white”) has something of the texture of wholemeal wheat bread flour, so everything I make with it reminds me of some of the vegetarian recipes I’ve followed, which always include wholemeal flour when they could just as easily include white or sauce flour. So the cookies are pretty good, like standard cookies made with wholemeal, which makes me wonder about making digestive biscuits. For the pizza base, I used 125g teff topped up to 150g with cornmeal for added crunch. The dough was very soft (softer than a cookie dough, looser than pastry) and nothing like traditional dough. So you have to push it into a tin by hand. I lined the tin with baking parchment because I’ve learned the hard way that gluten free stuff tends to stick more. After about two hours, I topped the base with the usual pizza toppings, and I baked it in a hot oven for about 15 minutes. The result was much better than my previous attempts (and those I’d bought in supermarkets). A crunchy crust that was quite palatable – you could convince yourself that you were eating a regular pizza made with wholemeal flour. Onto the crumpets. Last weekend, I tried crumpets with Doves GF flour, but they ended up stodgy, without the right kind of texture. Disappointing, because Warburton’s GF crumpets are among the few bread products I’ve tried that are okay (if expensive, which is why I wanted to make my own). So I made the same recipe again, but swapping out half of the flour for teff. I also tweaked it by adding a bit more salt, more bicarbonate of soda and a hair more yeast. This time, the batter fermented very well, and the resulting crumpets taste good and have a good, aerated texture. In colour, they look yellower than regular crumpets. After two batches of four, I was a bit fed up of the crumpets sticking to the rings (hard to get out because they were so hot), so I just cooked the rest of the batter as pikelets, which was perfect. In the future, I’ll not bother with the rings and I’ll just make batches of pikelets. These are great when warmed in the toaster and spread with butter. Nirvana! Cake au jambon – a French style savory cake made with a jar of green olives and some bacon or ham. Works perfectly well with GF flour, and because it’s an enriched dough, it’s fairly indistinguishable from the original. GF naan bread – while not as puffed up as regular naans, these were pretty good really, and went down well with a chicken curry. GF dumplings – these were nothing like dumplings, but fairly close in nature to scones, or what the Americans call biscuits. We had something similar at school, and they called it beef cobbler. After all this, I think I can go forward, though I’m still obviously hoping that my possible gluten intolerance is not a thing, and I can go back to eating wheat. In terms of my eczema, the itching continues, four weeks into the experiment. I’m not really the kind of person who would give up something like wheat just because, under my 21st century clothes, I’m still a caveman who didn’t evolve to eat refined white flour. I’m aware of course of the one percent of the population who have a genuine health reason (coeliac disease) not to eat gluten, but I’ve also been peripherally aware of a number of people who have taken to a gluten-free diet for unspecific lifestyle related reasons, in much the same way as one might give up red meat, or go organic. But, see, I’ve had this eczema-like itchy rash for several months now, and I was at the hospital for a biopsy, and the doctor asked if I had tried giving up gluten. Well, I said, I cut it out for a couple of days in the summer (because I’d been reading widely about possible causes for my mystery rash), but it made no difference. A couple of days isn’t enough, she said. You have to go for several weeks at least. It is important to appreciate that a gluten free diet may have no effect on the rash for approximately six months and sometimes, even longer. That sound you hear, like water going down the plughole, is my life draining away. I’ve spent 30 years of my life, for example, perfecting my home-made pizza(s) recipe. I’ve got a 25kg bag of Italian 00 pizza flour in the cupboard and home-made sweet fennel sausage (containing gluten) in the freezer. And I want to cry. Obviously, I can still make it for other people, but not to be able to eat it myself is like (*reaches for grandiose comparison*) Moses not being able to enter the promised land or Jonny Ive not being able to use an iPhone. The supermarkets are making a lot of money out of the gluten-free crowd. It’s kinda criminal. A teeny tiny loaf of urky bread full of holes costs more than a full-sized standard loaf. A ciabatta roll costing twice as much as a standard one is also half the size. If something costs a couple of quid, the gluten-free version is £1.50 more, and has a weird texture and tastes worse. So here’s hoping my biopsy result is negative for that thing, that dermatitis herpetiformis thing. Anyway, I’ve tried quite a lot of gluten free food over the past week or so. Oats for breakfast, and oat biscuits: acceptable. Almost every variety of bread: glop. Pizza: cardboard*. On the plus side: Pieminster chicken pie: good; quiche: also decent. Tesco carrot cake: actually pretty similar to the real thing. So it seems that cakes, biscuits and pastry can be replicated, but anything bread-based is a big fat nope. *The pre-packed pizza problem is not aided by the fact that I KEEP FORGETTING the damn things are in the oven. They don’t cook like a normal pizza. They seem to use weird cheese that doesn’t MELT, which means I usually end up carbonising it, like the one above. So I bought this to use in my kitchen in France. I wasn’t going to spend a fortune – it’s only for two months a year. I’ve aways used Magimix in the past. I don’t mind them. I appreciate the single-speed motor and the all-round simplicity of the design. I’ve always objected to the unnecessary gubbins you get with food processors (extra, smaller, bowls, storage compartments, attachments you never use), but there’s no avoiding them. The Kenwood was £99, as opposed to a whole lot more for a Magimix. I just needed something to help me chop, grate blend, mix, etc. in a kitchen that has absolutely nothing in it (not even a worktop) bar the two sharp knives I bought in the summer. It doesn’t feel very solid. It’s lightweight, but it does stick to the surface using suction cups. I’m placing it on an old formica table, and it doesn’t move around, which is good. Arrives in an oversized box and includes a blender, a small attachment for chopping nuts/herbs, and the usual bowl, along with four discs and two blades, one supposedly sharp, and one for dough. So far I’ve used it to grate vegetables for coleslaw, grate a bit of cheese, make some dough, make some breadcrumbs, and chop some herbs, gerkins, and so on. The most important bit for me was the dough mixing, as I hate kneading bread by hand. Here we have a problem. I was using unfamiliar (type 55) French flour purchased in E Leclerc, so I wasn’t sure how much water it would absorb. In the end, I made a somewhat wet dough on first attempt, and then had to spend a lot of time scraping out the bowl. The dough gets everywhere, including up the inside of the bowl centre. and all over the spindle (and inside it). The spindle is very different from a Magimix, and needs to be attached in advance of the bowl. The bowl and everything else will only go on in one way. So the sough got everywhere. My second batch, I added less water, but still found it got everywhere, and didn’t mix well, either – I had to finish by kneading by hand, and I was blending a soft sticky bit with a solid lump. It really wasn’t very efficient at mixing (whereas my memories of doing the same thing in a Magimix are that it mixes quickly and cleanly). For the coleslaw, I had to deal with a large number of ungrated lumps of cabbage, apple, pear, and onion. What it grated, it grated well, but it must have left 25% or so ungrated. Again, inefficient. Chopping herbs in the small herb chopper, or chopping gerkins in the same attachment: again, not very efficient. You’re dealing with some bits that are virtually liquidised, and others that are still more or less whole. As for creating breadcrumbs, this should have been easy. I had a number of bits of 2-day-old bread, and I put them in the main bowl with the supposedly sharp blade. Well. Not very good. I think I could have stood there all day, and I’d have ended up with big lumps of bread mixed in with the breadcrumbs. I expected to be disappointed, because I knew I was compromising, but it’s really not very good at all, not much of a labour-saving device, and not much of a time saver, either. If you can afford it, get a Magimix. If you can’t afford a Magimix, invest in a really sharp knife and a decent cheese grater. Judging from photos on the interwebs, there are a number of ways of producing a marble rye like the one immortalised in the Seinfeld episode The Rye. 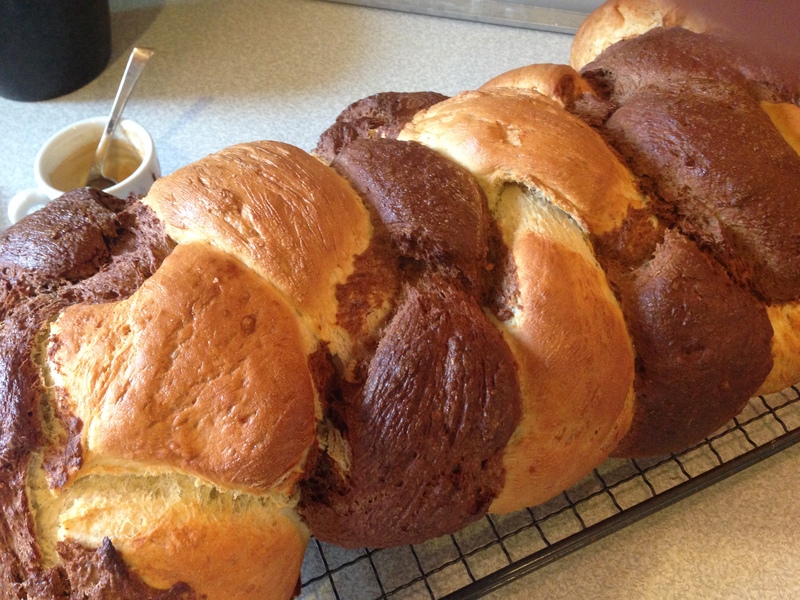 My memory of the one in the show was that it was a plaited loaf, a challah, so I decided to try that. Yesterday, I dipped my toe by making a couple of two-strand loaves, using a viking loaf dough and a lighter, unseeded, half. It worked quite well (and was delicious), so I decided to try a 4-strander of enormous proportions, but with no seeds. I started the dark half with 150g of wholemeal rye flour mixed with just 50g of wholemeal wheat, half a teaspoon of yeast and enough water to form a dough. I left this overnight. 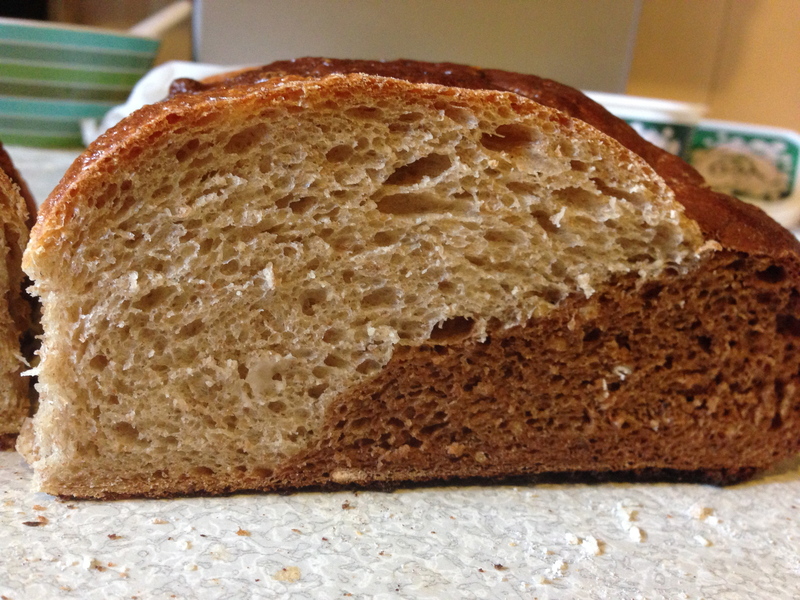 As with all overnight sponges made with dark rye flour, it didn’t do much – didn’t form a dome or anything, although the lump of dough itself expanded and did ferment. The following morning I added 100ml water, then 140g of wholemeal bread flour, 140g of French bread flour (the Flour Bin’s Type 55), two teaspoons of fast-action yeast, two tablespoons of cocoa (for colour), a tablespoon of treacle, one and a half teaspoons of salt, and about 20g of butter. I started the mixer, and added another splash of water, and kept adding water until I had a good sticky dough. It mixes for a long time before the gluten starts to develop. I added a little more water now and then, until I was happy with the consistency of the dough (sticking to the bottom of the bowl but not to the sides). I left it to rise. For this I used the same method, but substituted the Flour Bin’s lighter rye flour and used white bread flour instead of wholemeal. There was no cocoa, and I used a teaspoon of sugar instead of treacle. Again, I added enough water to form a stretchy dough that stuck to the bottom of the bowl but not to the sides. 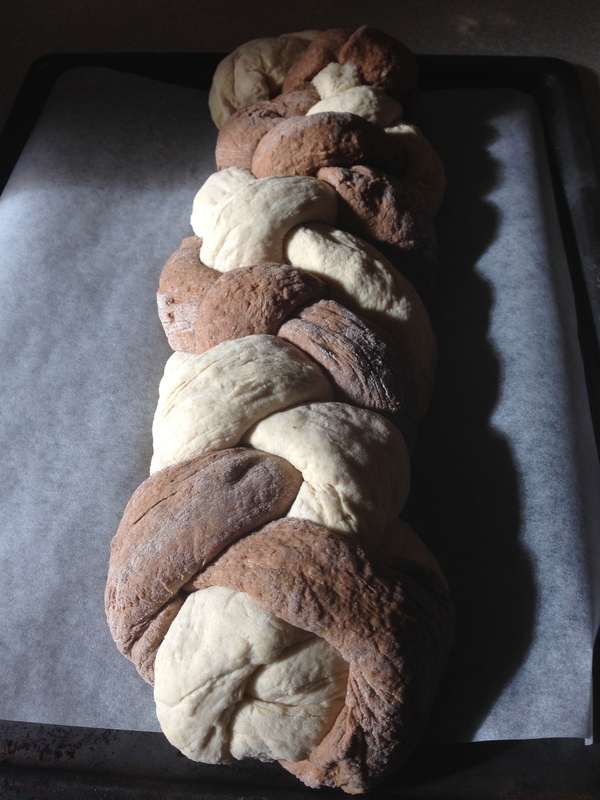 When both halves had proved for an hour or so, I divided each batch into two and then created some long strands for plaiting. I’ve almost never done this kind of thing, and had to look at a youtube video to get the method right (4 over 2, 1 over 3, 2 over 3, repeat). I left this to rise with a clean cloth over it, and when it started to look right, turned on the oven. I left it on the standard “baking” setting, 205°C with the button set to the bread icon. I brushed the top with an egg-water glaze for shininess, then put the loaf in the oven. It was almost too big for the width of my oven, even though it was on the metal tray that is its own shelf. Shut up, you old bag! But the proof will be in the tasting. Got to wait for it to cool. UPDATE: Tasted great. Eaten with home-made butternut squash and celery soup, or just on its own with or without butter. Delicious. Following my first experiment, I wanted to try essentially the same thing using the overnight sponge method, hoping to develop more flavour and more of an open texture. This time, I decided to leave the butter out, because with a dough containing both cocoa and treacle, there was a danger of making it too cake-like. I ordered a variety of flours from the flour bin, and decided on this occasion to use their multi-grain mix along with a dark rye flour. The overnight sponge was made with rye flour, a half teaspoon of yeast, and – experimentally – breadcrumbs from the last Viking loaf I made, soaked in milk. This was a suggestion from commenter Rashbre, a technique used in German rye breads. I spoke to one of the German teachers at school about this, too. I pre-cooked the milk in the microwave and then used it to soak the breadcrumbs I made in my blender from the end bit of the last Viking loaf, which I had set aside for this purpose. I made a double batch of sponge, so I used 300g of dark rye altogether, along with about 250 ml of milk. It wasn’t very dough-like. This you expect with rye flour, which doesn’t have enough gluten in it. It didn’t look very inspiring, and didn’t seem to do much. I made it around 4pm on Friday evening, and even by the time I went to bed it didn’t appear to be alive in the way some dough starters are. Got up this morning and split the starter in two. Had it done anything overnight? It didn’t look like it had, but it sure smelled fermented. It smelt great, in fact, like a proper sourdough, which gave me confidence going forward. I made two batches. The first with 280g 100% 8-Grain Flour Mix added to the rye starter, along with a tablespoon of cocoa and one of treacle. Around two teaspoons of fast-action yeast, 250 ml water, and (once the dough was looking stretchy in the mixer) 1 1/2 tsp salt. You should add water in stages, because this was a wet dough. I left it on the wet side, though I did add a couple of tbsp of flour bin Type 55 French bread flour, too. The second batch was made with half 8-Grain and half Type 55. To the first batch, I added a handful of caraway seeds (often added to rye recipes); to the second a handful of toasted sunflower seeds. The dough took off like gangbusters, which was a surprise. I know the Flourbin put vitamin C (ascorbic acid) in their French bread flour, but both batches seemed to rise at similar rates, so they were just raring to go. I shaped both batches into loaves: one in a tin, the other not, and left them to rise a second time. Haven’t tasted the second loaf yet, but the one above was great. A lovely mixture of flavours with the occasional burst of caraway. In France over the summer, I became enamoured with the Banette Viking, a very dark seeded loaf that only seemed to be in the bakery occasionally. It turned out that they only baked them on Tuesdays, Thursdays, and Saturdays, and even then only made around four. On the last Saturday, I bought all four, and brought some home with us, but they’re all gone now. 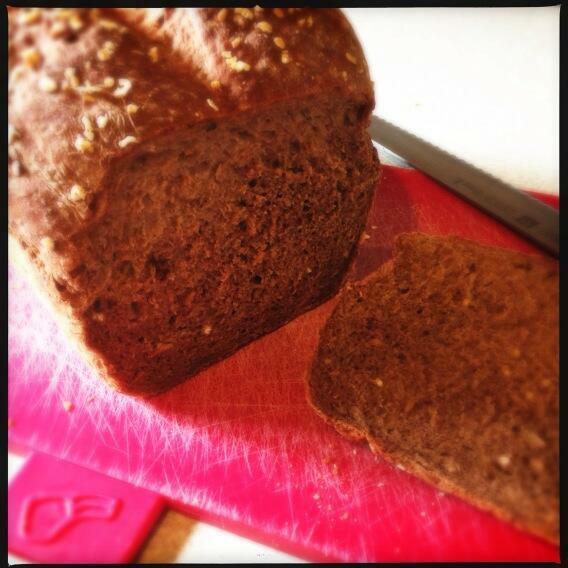 The Viking is clearly related to Scandinavian/Russian black breads. 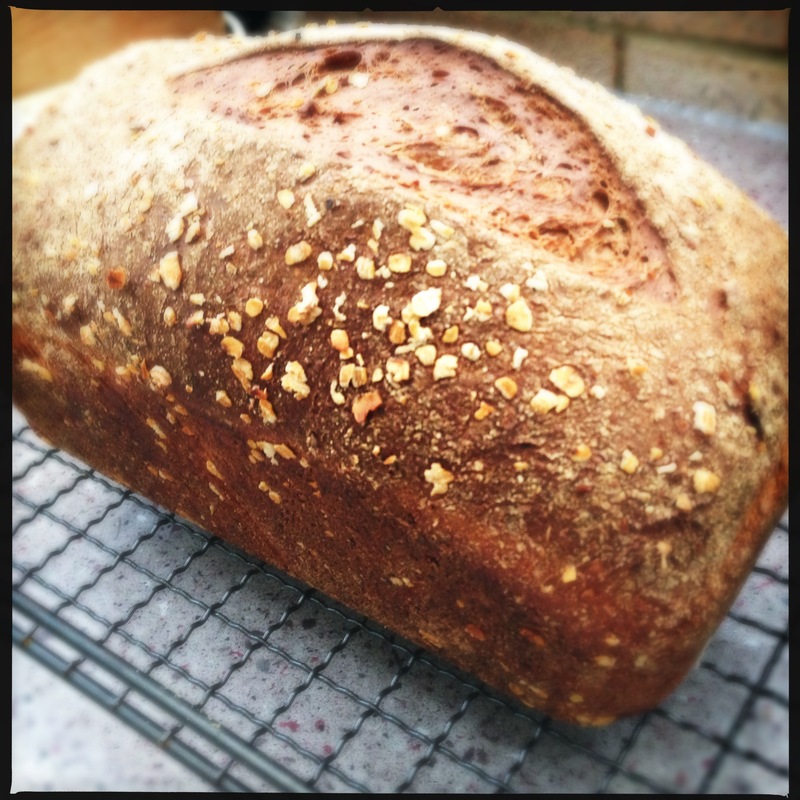 It’s obviously got Rye flour in it, as well as sunflower, sesame, linseed, and millet seeds. It also has something to give it that dark colour. Rye flour on its own is more grey than black/brown. A sniff revealed the presence of cocoa – and probably treacle. No wonder it was so delicious! Unlike most heavy rye breads, it had a light, airy sourdough-type texture, which might explain why it was only in the shop every couple of days. When I have time, I’ll have a go at a two-day bake, but for my first attempt, I wanted to mix ingredients and go for flavour/colour before tackling the sourdough texture. I let the mixer run for about 10 minutes, and adjusted the amount of flour slightly because it was a wet dough. Ideally, you’d add the water in stages. I put it to rise in a warm place because I was in a hurry, and after an hour or so, knocked it back and shaped it into a loaf for a tin. I rolled it in oats before putting it into the oiled tin. It rose quite well. Then I slashed the top and baked at 220°C for 30 minutes. You can see the results above. It was actually pretty close to being the right colour, and tasted very close to the original (maybe I added a tad too much cocoa!). Just had a slice with a poached egg for breakfast. My next plan is to source some multi-seed flour from theflourbin and try it with that.